I have flipped over 200 houses, and one of the most time-consuming, hardest parts of the business is being able to quickly and accurately estimate repair cost. Sign up now for Jim’s Secrets to Designing House Flips that Sell Fast! Webinar. I’ve lost tens of thousands of dollars on my first fix and flip deal…… all because I didn’t know how to accurately calculate rehab cost. Not to mention, the countless amount of deals I missed out on because I took to long calculating cost and didn’t get a offer in. In today’s video blog, I review The Secrets to Knowing Your EXACT Profit on a Flip Before You Even Buy it! P.S. 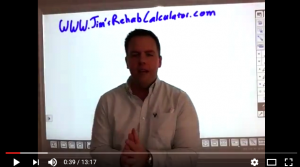 – “If you want a super easy and fast way to crunch the numbers on your deals, check out my Rehab Calculator.